I first came across the Kangaroos rugby league team late in 1967. Having just arrived in Australia for our biannual holidays from our home of Papua New Guinea, I looked forward to cramming as much TV into three months as I possibly could. Pretty early in the holiday (early November) cricket and rugby league appeared on my radar for the first time. The 1967-68 Kangaroos had Reg Gasnier as captain-coach. Gasnier, or ‘Puff the Magic Dragon’, was one of the greatest ever rugby league players. After playing in the first Test, a recurring knee injury kept him out of the remaining five internationals against Great Britain and France. By the time he returned for a midweek game in France, he realised his career was over at the age of just 28. As with Bobby Simpson in cricket, I don’t remember much of him first-hand, and I take his selection mostly on trust, because he did appear in my time, if ever so briefly. Others to end their Test careers in 1967-68 were Johnny Raper, Ken Irvine and Noel Kelly, although I continued to see them play over the next three to six years. Graeme Langlands, Ken Irvine, Reg Gasnier, Mal Meninga, Greg Inglis, Wally Lewis (vc), Andrew Johns, Noel Kelly, Cameron Smith, Arthur Beetson (c), Bob McCarthy, Ron Coote, Johnny Raper. For the state conscious, the split is NSW 7-6 Queensland. The NSW men are Langlands, Irvine, Gasnier, Johns, McCarthy, Coote and Raper, while the Queenslanders are Meninga, Inglis, Lewis, Kelly, Smith and Beetson. Ten of this team captained the Kangaroos, while all were or are club captains. I know that today’s players are bigger, stronger and inherently faster than those of yesteryear. But the comparison is always about how each player dominated in his own time, and the influence he exerted. That is the ultimate comparison. 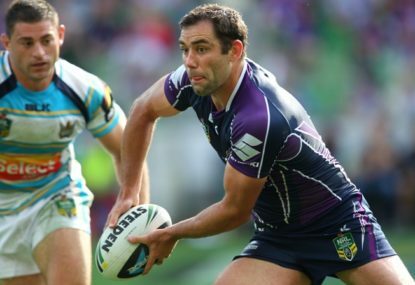 As good as Inglis is, I’m happy for ‘Changa’ Langlands to be my fullback, with GI on the wing. The hooking role has changed enormously in regards to the scrum. However, hookers can still be compared across the ages according to their play from dummy-half and in general. In this regard, Smith is unmatched. I am 100 per cent happy and comfortable with every first team selection. Darren Lockyer, Andrew Ettingshausen, Laurie Daley, Brad Fittler, Kerry Boustead, Bob Fulton (c), Johnathan Thurston, Craig Young (vc), Danny Buderus, Glenn Lazarus, Paul Sironen, Bob Lindner, Ray Price. The state split is NSW 9-4 Queensland. While I have no problems with my firsts, there were plenty of 50-50 calls with my seconds. Lockyer, ET, Boustead, Fulton, Thurston, Buderus and the backrow are all locked in. But I concede the centres and props caused me plenty of grief, and there might be better alternatives if someone can convince me. Mick Cronin, Steve Rogers, Brett Kenny and Gene Miles will have their cornermen in the centres, while alternate selections at prop are many – Shane Webcke, Petero Civoniceva, Paul Harragon, Steve Roach, Greg Dowling, Bob O’Reilly, John O’Neill and John Sattler.